BATON ROUGE, La. (AP) LSU wide receiver Malachi Dupre knew what he signed up for when he joined the same college program as fellow south Louisiana native Leonard Fournette. Dupre wants the ball, but can't quibble with LSU offensive coordinator Cam Cameron's decisions to keep the ball on the ground with Fournette. The running back has emerged as a leading Heisman Trophy candidate with the eighth-ranked Tigers. ''Leonard has been running the ball crazy,'' Dupre said. ''What he has done so far is incredible. But, we are going to face some great defensive coordinators later in this season. The only way to win a national championship is for us to throw the ball. Though Dupre is not surprised at Fournette's impressive numbers: 631 yards and eight TDs rushing in the first three games this season. Two seasons ago, they were the top two high school recruits from the New Orleans area. Dupre and Fournette's high school teams met that year, with Fournette's St. Augustine squad rallying for a 29-28 victory over Dupre's John Curtis team. The star of the game was Fournette, who ran for 255 yards and two touchdowns on 34 carries. He also caught a 27-yard touchdown pass which set up St. Augustine's game-winning 2-point conversion. And though Fournette is putting up big numbers on the ground for LSU, the Tigers passing game has been well below average, with a total of only 302 yards through the first three games. Dupre is the lone receiver with more than 100 yards on catches from quarterback Brandon Harris. Still, Dupre asserts that LSU can't be one dimensional if it wants to reach the College Football Playoff. ''We have the ability to move the ball up and down the field with our passing and Leonard can hit a home run on any play,'' Dupre said. While Fournette ran for a career-high 244 yards against Syracuse last Saturday, the LSU passing game offered a glimpse of its potential. While Harris completed only 8 of 16 passes for 157 yards, he came up with several clutch completions. Six of Harris' completions resulted in a first down or a touchdown. On the Tigers' second series, Harris completed first-down passes of 12 yards to Dupre and 14 yards to Trey Quinn. 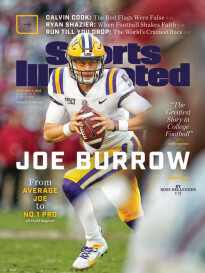 Then on LSU's first series in the second half, Harris converted a third-and-four situation with a 42-yard pass to Dupre, setting up a field goal. In the fourth quarter, the Tigers led by only one touchdown when Harris, on third and 9, hit Travin Dural for 51-yards. On the next play, Dupre caught an 11-yard scoring pass. Next up for LSU is a home game Saturday against Eastern Michigan. But regardless of who the Tigers play, they do not need a prolific passing game. LSU simply must keep opposing defenses honest. During the 2010 and 2011 seasons, the Tigers won 24 of 27 games. LSU averaged just 155.6 yards per game passing in 2010 and 152.5 yards per game passing in 2011.